Supergirl deals with conflicts that have been lurking just below the surface as M’yrnn’s illness worsens to the point that it affects other people. One of the great things about science fiction is the potential to explore something real through a fantastical lens that can exaggerate the point so that it resonates more clearly. This is what this show is doing with M’yrnn’s illness. It was revealed last week that he is suffering the early stages of the Martian form of Dementia which is pretty much the same as Human Dementia except with psychic abilities. M’yrnn is shown to be losing control of his psychic abilities through his attempts to manage his illness and ends up causing harm to those around him. It’s a very clear metaphor for how such an illness will impact the families and friends of those who suffer from it. 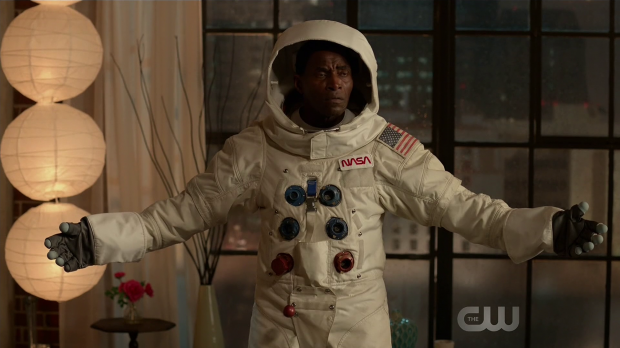 This is a great showcase for David Harewood as an actor. J’Onn deals with a lot of complex emotions in this episode as he watches his father deteriorate before his eyes. He mentions early on that M’yrnn is handling the situation better than he is which becomes more evident as the episode progresses and J’Onn struggles with the reality of what needs to happen next. 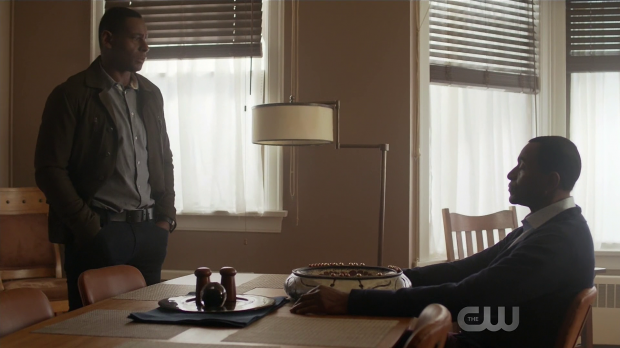 From J’Onn’s point of view this is a really difficult thing to accept as he only recently learned that his father was alive and now has to deal with the prospect of losing him to a degenerative illness. It’s a brutal truth for him to accept and David Harewood plays that anguish wonderfully. J’Onn is a character who is often confident with a clear idea of how to handle a given situation so to see him struggle with this is appropriately jarring. It’s something he isn’t prepared for and is incapable of dealing with. Alex is able to provide some practical advice because her mother went through the same thing with her grandmother. It got to the point where Alex’s grandmother was a danger to herself and others so her car keys had to be taken from her. It was painful but also necessary and the difficulty of treating a parent like a child because it was the right thing to do for everyone is acknowledge. J’Onn is facing that reality and has to take the same action for the protection of everyone. Kara puts it perfectly when she quotes the famous line spoken by Jor’El in the Christopher Reeve Superman movies “The son becomes the father and the father the son”. This quote could have a few interpretations but in this case it relates to J’Onn becoming the caregiver for the father that used to take care of him. It’s a significant transition in their relationship and not one that becomes easily. Carl Lumbly is also excellent in this episode, playing a man trying desperately to hold onto his dignity. M’yrnn mentioned last week that J’Onn has done so much for him that he doesn’t want to be a burden any longer and even though Alex convinced him that he would need help to manage his condition he still struggles with the idea of accepting the level of care that he needs. Once again this is very real and relatable as many people in similar situations have the same reaction. M’yrnn tries to combat his condition through prayer and exercises geared around keeping his mind sharp. It works to a degree early on but the whole point of the illness is that it’s degenerative so the progression is inevitable and M’yrnn isn’t prepared to accept that early on. At its core this is a story of a man terrified of losing his dignity and doesn’t want to rely on others to live his life. Once again this is very real and the execution of the story is very moving. This culminates in the eventual acceptance of what needs to be done on M’yrnn’s part. At first he resists J’onn’s attempt to dampen his psychic abilities because he feels that his own son is putting him back in the cage that he was in for 300 years. This assumption is motivated by denial and pride which eventually gives way to pained acceptance. Eventually M’yrnn’s realises that his inability to manage his condition is causing harm to others and he lets his son to help him. This plot was handled really well and allowed for lots of compelling character drama but it also feels somewhat rushed. The illness was only revealed last week so it feels jarring for it to escalate so quickly. It might have felt more natural had it built gradually over a few episodes before getting to this point. The outward nature of M’yrnn’s illness allows resentments to climb to the surface, There is also a randomly angry member of the DEO’s HR team who goes straight for Winn as well as a colleague of his who resents him for being so casually accepted into the DEO because he happens to be friends with Supergirl. It’s easy to see why this would stir up resentments from Winn’s colleagues as they have worked really hard to get where they are where Winn seems to have simply wandered into a cushy position. As he points out he is more than skilled enough to justify his presence but this reaction does make sense especially when amplified by M’yrnn’s condition. I would like to know why the HR employee is so upset with him though. More importantly is the pent up resentment Kara feels towards Mon’El. She lashes out at him both verbally and physically because her feelings have never been fully resolved and she has still been suppressing them even though they are in a better place than they were previously. Kara’s main issue is with Mon’El’s current attitude being vastly different to how he was before he left. Somehow his more mature and heroic persona reminds him of how mature and selfish he used to be and she finds it a little difficult to deal with that as the transition is fairly instant from her point of view. Her objection isn’t because he is now a better person, she has a problem because she remembers how he used to be and rattles off examples of how he threw any of her attempts to help him improve in her face without making any apologies for it. It might seem pretty to a certain degree but it’s also a sign of Kara shaking off the romanticised version of her relationship with Mon’El that she has chosen to believe. It’s a reasonable coping mechanism after losing him and she’s starting to remember how difficult it was for them to get together and then stay together. Kara’s strength of character is further reinforced by showcasing these buried feelings and showing that she doesn’t let her personal issues get in the way of letting Mon’El help her prepare for her next fight against Reign. 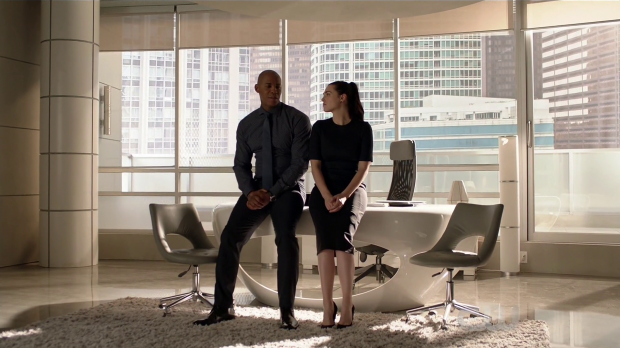 She may have struggled to be in the same room as Mon’El earlier the season but she has come a long way and found a way to deal with it even if it means burying those feelings. They do seem to be dealt with now and hopefully this means they can truly move forward though I suspect that a reunion of some sort is upcoming. The training was handled really well and brought a new visual flourish to the show. 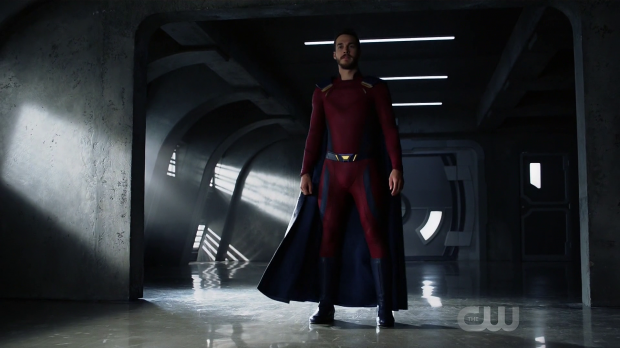 It’s good to see Mon’El in a comic accurate costume that also works on screen. Cape tricks might seem a bit ridiculous on the surface but the idea is sound as or lets Kara learn a new skill and gives the cape a defined purpose. Having her learn something new is also a sign of growth as Kara becomes a better hero by learning a new skill while also recognising her own limitations in her previous bouts with Reign and looking to overcome them. I’m not sure that cape tricks will be the key to defeating Reign but it will likely give Kara an edge for at least a short time during their next encounter. Generally speaking the episode had some really good action. The chaos in the DEO thanks to M’yrnn’s condition was handled really well while complimenting the emotional drama to increase the stakes. J’Onn trying to comfort his father as a White Martian looms nearby is just one example and results in a really cool fight between J’Onn and the White Martian suggesting that he sees this as a problem he can solve. There’s a catharsis attached to him punching the White Martian as it certainly comes across as therapeutic. The first action sequence in the episode was brief but punctuated by some fun one liners. Kara carefully unbuttoning her shirt because she likes it was a really nice touch and her comment about having the high score after being thrown into an arcade cabinet was cheesy but not offensively so. This comes after an adorable game of charades that once again gives this show an edge of the other CW DC shows by allowing the characters to have fun and show that they enjoy each other’s company outside of a crisis. Lena has Sam trussed up in a secret medical facility as she tries to get to the bottom of her transformations. She has learned a lot of useful information such as Sam’s transformations into Reign causing her DNA to rewrite itself on a cellular level which means that the two sides of her are completely distinct. Reign is completely different personality with her own genetic structure which somewhat absolves Sam of the guilt associated with all the murders she has committed. It may look like her physically but otherwise there is no connection. This seems to settle the debate over whether Ruby is part Kryptonian experiment or not. Assuming the DNA completely shifts between Human and whatever Reign actually is then Ruby is more than likely completely Human. The main purpose of Lena and Sam’s plot within this episode is to deliver more information about the Sam/Reign connection while also forcing Sam to deal with the fact that she has a split personality. As with pretty much everyone else in the episode she is in complete denial and refuses to accept it despite the overwhelming evidence. She knows that she’s human, gets sick and has been injured so it makes no sense to her that she could be an invincible supervillain. This does seem to ignore the fact that Sam was concerned about being impervious to bullets and knives earlier in the season but in her state of panic it’s possible that she could have forgotten about that. It makes sense that she would have difficulty processing what she has learned and is terrified about what that could mean. Lena has to force her to accept the truth and manages to do this after James gives her some really insightful advice about an old roommate he had who had a similar enough problem. It’s a great scene that once again puts James in a key role as someone who understands people and can offer different solutions to problems. This sort of thing is a much better use for him than being Guardian. It also allows for some development of their relationship after receiving very little so far even if it doesn’t offer much more than a reminder that they have one. I do applaud the writers for not creating artificial problems with Lena being dishonest with him when the more mature approach of telling James some of the truth but making it clear that it’s not her place to say any more than that. The explanation is reasonable and James accepts it because he’s an adult who realises he doesn’t have the right to know everything about Lena’s life. This is a great approach to relationship building that I want to see more of. Sam’s realisation that she is Reign is handled brilliantly. Lena’s “cruel to be kind” approach is really brutal and something she clearly has trouble with. Her strength of character comes from the fact that she is willing to go through with it and feels that Sam needs to know the truth to help in finding a cure. Katie McGrath is excellent in this scene as is Odette Annable who plays the building rage wonderfully. Her reaction once she can no longer deny the truth is great as well. The guilt she feels over being involved in the deaths of so many people is a natural Human reaction even though it’s clearly not her fault and her need for support from Lena makes great use of the strong friendship that has been developed. This should create interesting scenarios around Sam dealing with knowledge of her double life. An excellent episode that keeps character at the root of everything. M’yrnn’s advancing illness is handled brilliantly from all angles. M’yrnn is a man losing the ability to rely on his own mind as well as his dignity in the process. He doesn’t want to be a burden on his son but is swiftly getting to the point where he has no choice. J’Onn has to deal with trying to convince his father that his illness has to be managed and deal with the role reversal that comes with it. The psychic fallout from the illness is a strong metaphor for how Dementia affects everyone in the life of the person afflicted and the realistic approach to what has to be done thanks to Alex’s advice also comes across as relatable. It is perhaps too soon for the illness to escalate as much as it has given that it was only introduced last week but it is well handled. The outward nature of the illness also allows Kara to deal with her feelings of resentment for Mon’El allowing her to address how jarring she finds his complete change in attitude as well as push aside the romanticised notion of their relationship that she has been holding onto. Lena’s and Sam’s contribution to the story is also really strong. The way it feeds into her relationship with James and puts a cross a really mature adult connection is definitely appreciated. 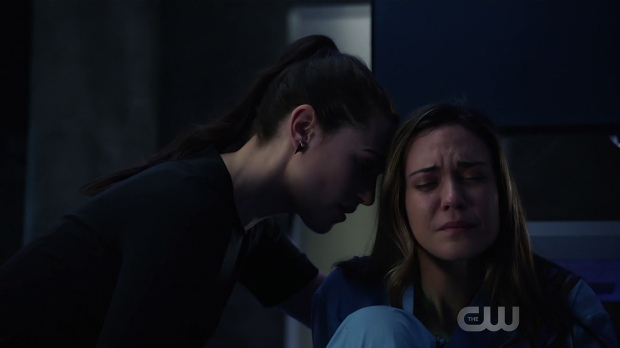 Lena’s “cruel to be kind” approach to convince Sam that she becomes Reign whenever she blacks out is nicely done as it makes good use of their strong friendship and features great acting from bother Odette Annable and Katie McGrath. A lot of potential has been creatrd by Sam learning the truth about herself and it moves the plot forward in compelling ways.